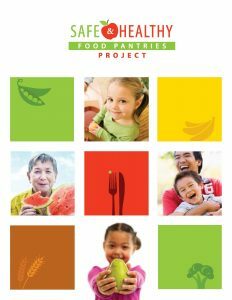 The Action Plan can illustrate how we can use the Safe and Healthy Pantries Project tools to evaluate your progress. That was a simple example that can tell the story of the adoption of a nutrition policy. 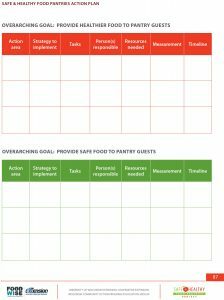 If the pantry wants to tell a more complex story, they can also add further tasks such as sharing the nutrition policy. 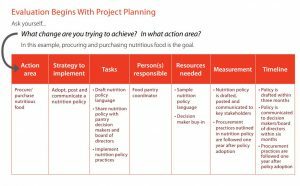 They can measure how the nutrition policy was communicated. They can do this by surveying the key stakeholders or interviewing key informants. 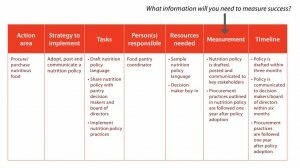 Another way of measuring how the nutrition policy was communicated would be to look back at records and see how many methods were utilized to communicate the policy. With the board of directors by a presentation from the pantry director. 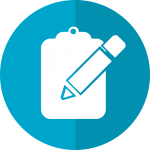 Many of you will have your measurement tools in your toolbox by completing self-assessments and the action plan and keeping good records.